This month the Bostik box is all about Tour de France. The box had a lot of blue, white and red crafting item. Little M my crafting buddy came over to help me create our monthly craft, we were looking through the box but to be honest this month we struggled with what to make. 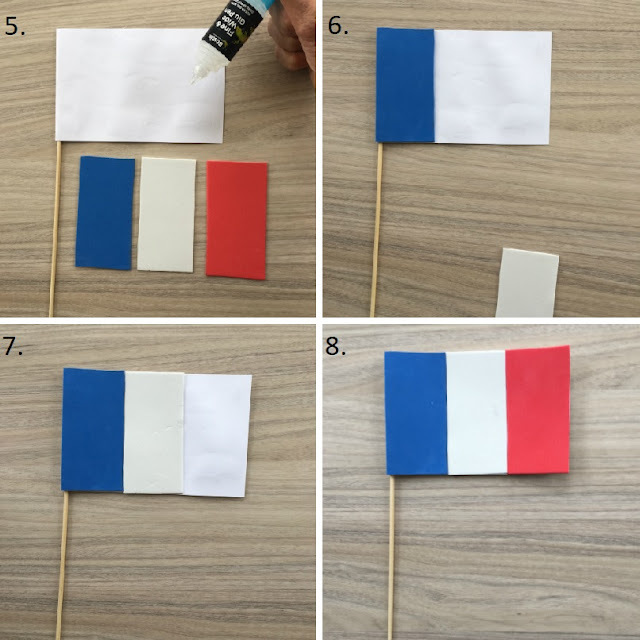 But then Little M and I started talking about France and so we made these cute flags for the theme. 1.On the white card draw rectangle 17 cm x 10cm and cut it out. 2. On the white cut out card, draw a 2cm margine on the right hand side and using the scissors score the line so you can make a fold over it. 3. 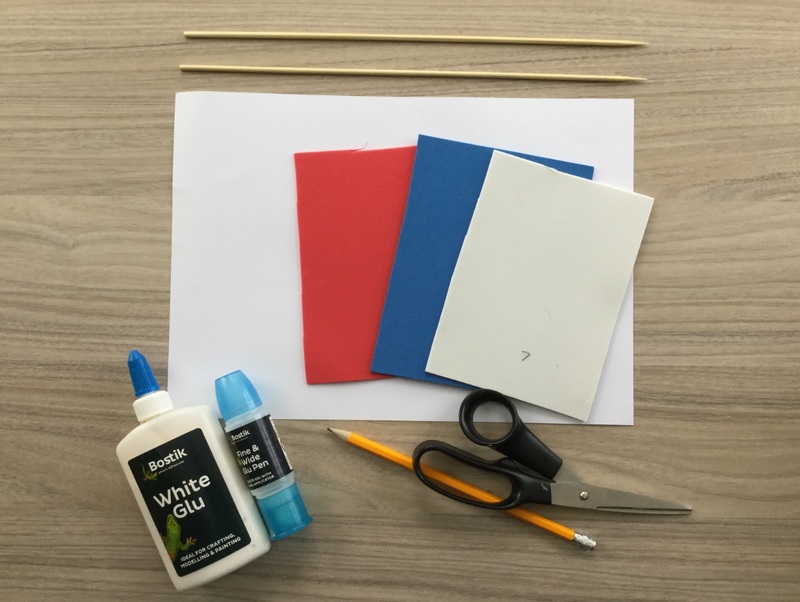 Place the skewer with the pointed side up on to the fold line and using Bostik glue stick the flap over the stick. You may need to secure it with a small piece of sellotape to hold it in place. 4. Cut out three rectangles 5 cm x 10 cm one from each colour red, white and blue funky foam. 5. Turn the flag over so that the stick is now on the left hand side. Spread Bostik glue all over the surface, and stick the funky foam rectangles Blue, white and red in the correct order. 6. Press down to ensure the foam is stuck properly. The flag is ready. This craft is suitable for young children although, adult supervision may be required for using scissors. If you like this project check the link below for more art and craft projects, that you can do with your children. Being part of the Bostik 2018 bloggers with Tots100 and Merrily Crafts, I was sent some craft items in a box to create this project. If you enjoy visiting citrus spice and travels and have not signed up would like to receive regular EMAIL updates and a monthly newsletter straight into your inbox please sign up by email. You will find the email signup right at the top under my photo in the side bar. or click the link below. Very cute - they would look fabulous on a cheeseboard wouldn't they! Now, I challenge you to make the Union Jack! My son would really love this especially since we're looking for all sorts of activities for the Summer! 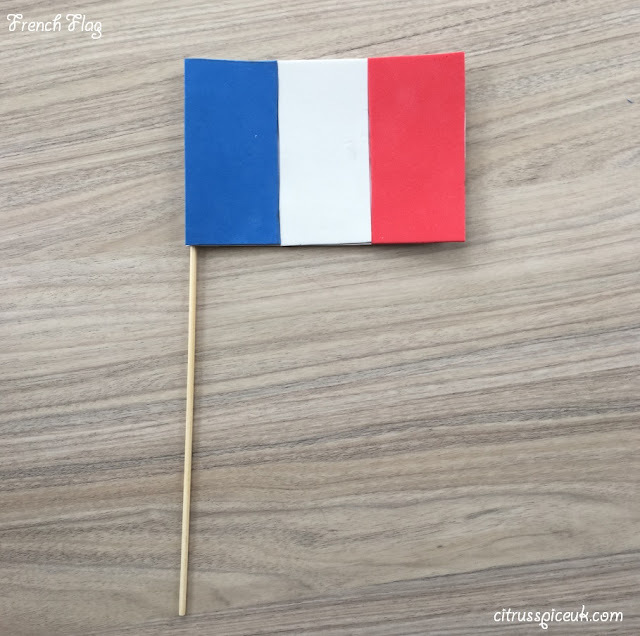 He loves guessing flags at the moment and can recognize the French flag very quickly too! This piece of art is good. Nice post.keep it up. We loved the theme for this month and had fun making a bicycle. Love your French flag. Cool craft! It sure looks easy to make, even little hands could do this. 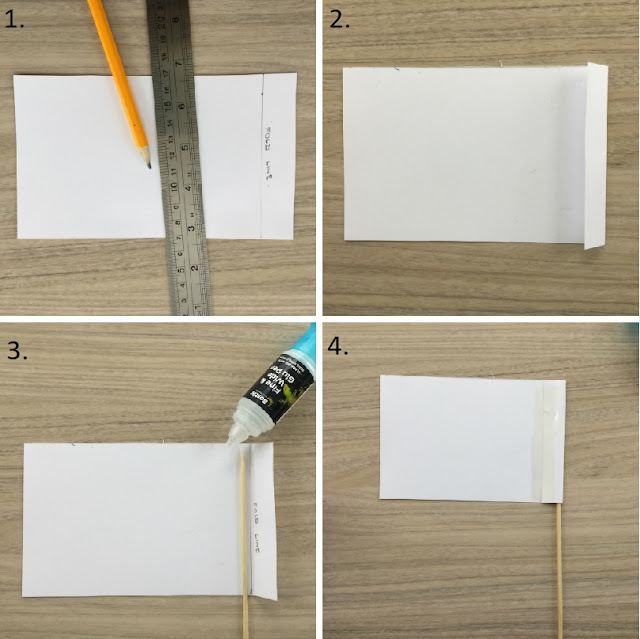 I think this would be a nice activity for kids, not only for crafting, but to also learn about the flags from different countries. This is such a cute project. So easy to make. Children will surely love making this. Very nice and easy project. I think my friends kids would love to try it. Oh wow aren't these flags fantastic. This could be a great food decor on some french style sliders I'm making for a brunch soon.